RAFAUT is a SASU company with a capital of 1 000 000,00 €, registered under number 572 199 743 at the Paris Trade and Companies Registry. 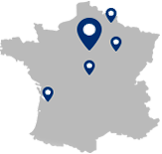 The Rafaut website is hosted by Pulsemedia, a limited liability company with a capital of 10000 euros, headquartered at 11 rue Jacobi Netter, in Strasbourg (FR. 67200). The general structure, together with texts, still or animated images, sounds, graphic elements, downloadable documents, databases and any other element constituting the website are the exclusive property of RAFAUT. Notwithstanding, the information in this website can be used by third parties under the following conditions: all information broadcasted directly on the website by RAFAUT, except for iconography, pictures, videos, logos and brands, shall be reproduced, represented or rebroadcasted to third parties after a simple notice to the webmaster, under the condition that the source is mentioned. However, they shall not be used for commercial or advertising purposes. RAFAUT holds the possibility, at any time, without prior notice and without having to motivate its decision, to forbid the use of the information as defined above by the relevant third parties. In such a case, it shall inform the relevant third parties which shall bring the use to an end within 8 working days. RAFAUT and its logo are registered trademarks and protected thereof by the trademarks legislation. They are the exclusive property of RAFAUT. All other quoted trademarks belong to their exclusive owners. RAFAUT authorizes any website to establish a link directing to the www.rafaut.com URL after a simple notice to the publication director. Any such links shall be activated nonetheless in accordance with the existing laws. RAFAUT holds the possibility, at any time, without prior notice and without having to motivate its decision, to forbid such a link. In such a case, it shall inform the relevant third parties which shall bring the link to an end within 2 working days. This process is devised to enable RAFAUT to follow visitors during their browsing on the RAFAUT website in order to better meet their needs and requirements. The www.rafaut.com website, as it has been initially devised, does not have the purpose to collect personal data on visitors. Notwithstanding it may be brought to do it in an ancillary way, especially for sending newsletters, for statistical studies or to answer questions directly put to the webmaster. In such a case, RAFAUT commits not to make a commercial use of the data with third parties and to withhold the data only for the period strictly linked to the data processing and use. Collected data is meant for the soled use of RAFAUT and for its subcontractors within the scope of their missions (the website host for instance). Therefore, any subcontractor which may, during its mission, be exposed to the collected data shall be subject to respect its confidentiality. It shall especially refrain from using for its own account or communicate to third parties all or part of the personal data. In this website, visitors may be brought to communicate personal data which may be subject to automated processing. Should this be the case, in accordance with law 78-17 of January 6 1978 on digital tools, files and freedom (article 34), people about whom personal data is collected have the right to access, modify, correct or delete such data. This right may be exercised through writing to the webmaster.